PayPal is an online payments system that supports online money transfers and serves as an alternative to Ubidots automated billing system. Step 2: Select My Profile from the user dropdown. 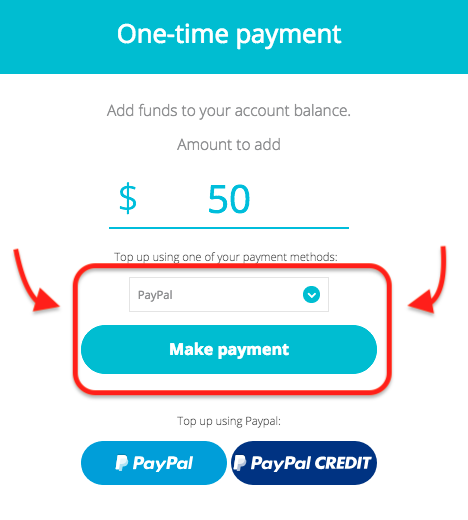 Step 5: Choose to add balance from your PayPal or PayPal Credit account. Step 6: Log into your PayPal account to verify payment to Ubidots for the selected amount. With a valid PayPal account saved as an available Payment Option, you may elect to make payments immediately by Adding Balance to pay any negative balances. When first subscribing to Ubidots as a new Developer license or greater, the first payment minimum is $20.00 USD. All payments collected via PayPal will be applied to the current balance of an account.